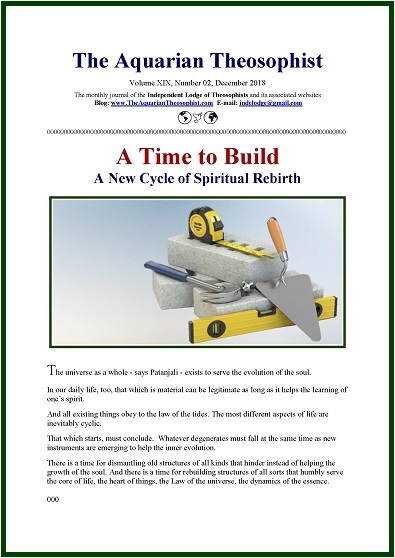 A new cycle of building is about to begin. On page two we have a fragment by Yogi Ramacharaka entitled “Mental Self-Training”. Then, “The Bliss and the Punishment”. On page four we present “The Psychoanalysis of Narcissism or Self-Inflation”. “True Friendship in Daily Life” – the fragment of a book by Drew Hunter – is on pages five and six. The note “Blind Neoliberalism Creates Confusion” comments the lack of ethical responsibility on the part of financial elites. It points to the need for the nations to avoid violence and promote peace and common sense. * The Final Chapters of the Book of Tao in the version published by Lin Yutang. The 19-pp. edition includes the List of New Texts in our associated websites. The entire collection of The Aquarian is available at our associated websites.